Now that you’ve familiarized yourself with the tools in the ribbon, configured your Quick Access Toolbar, assigned your keyboard shortcuts and experimented with the snaps in Part 3 of this series, it’s time to gear yourself up for modeling, starting with work planes. Figure 1. The Show button. 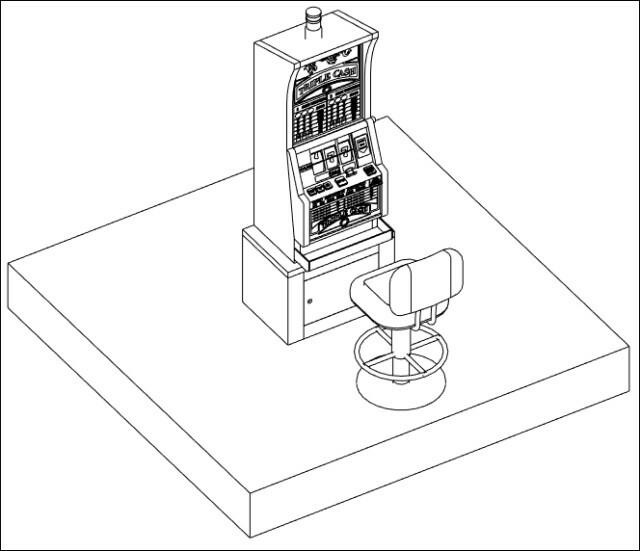 In the 3D world, the work plane is the surface where 3D elements are created and where 2D lines are sketched. 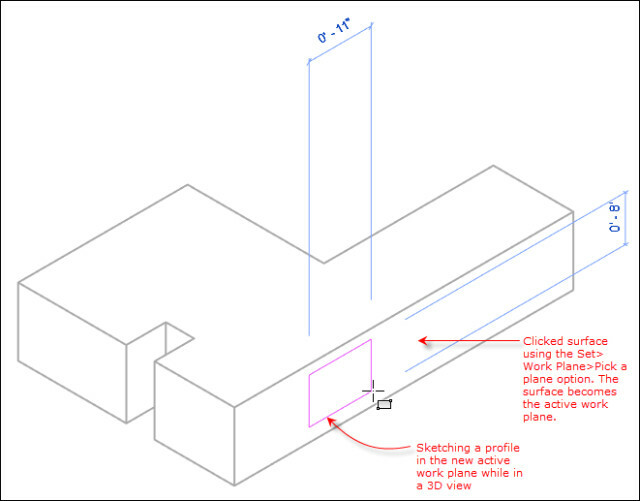 Any element modeled in Revit requires a work plane. When the Show button is clicked from the Create > Work Plane of the Family Editor (see Figure 1), the active work plane is represented by a light blue surface as shown in Figure 2. Figure 2. 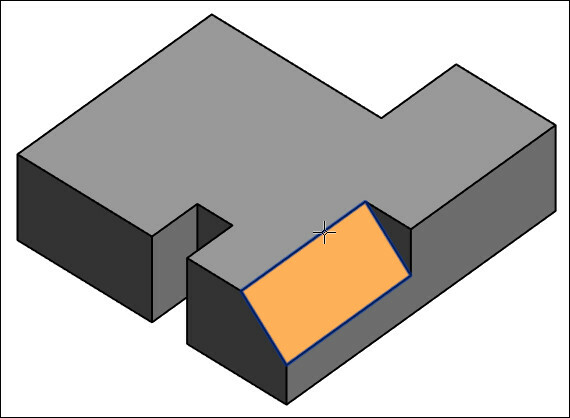 The work plane—shown in 3D view. 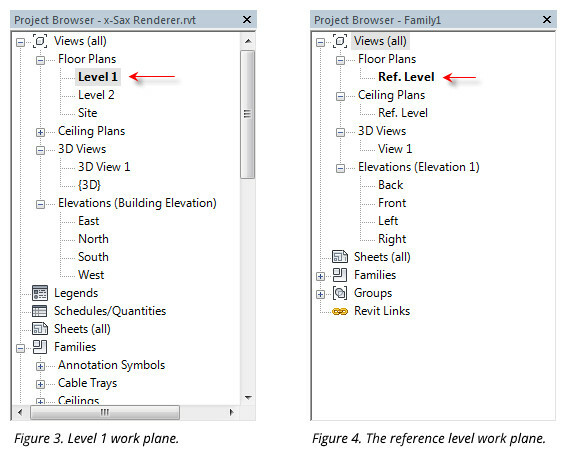 In the Project Browser > Views of a project, work planes are referred to as Level 1, Level 2 and Site (see Figure 3). Additional levels can also be added. In the Project Browser > Views of the Family Editor, the default work plane is referred to as the Ref. 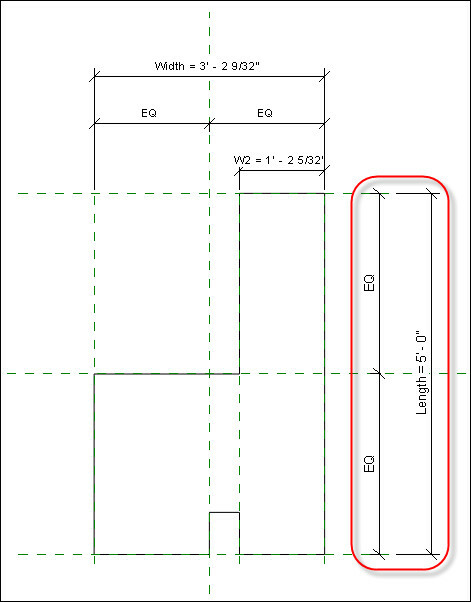 Level (reference level), as shown in Figure 4. Accept the default base location of the family in the level as it is brought into the project. In most cases, the family will be sitting on top of the Ref. Level work plane. After loading the family into the project, it will rest on top of the level’s work plane. 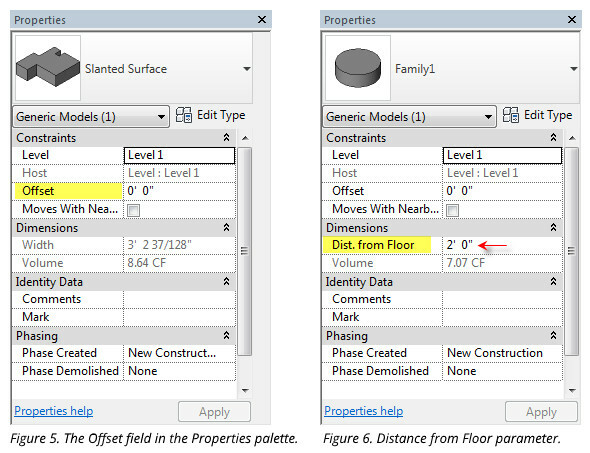 After loading the family in a project, enter a value in the Constraints > Offset field of the Properties palette (see Figure 5) or leave it at 0' 0". Enter a value in a specific field in the Properties palette if the family is parametric and was created with an offset parameter. In Figure 6, the family was created with an instance parameter named Dist. from Floor. These are the green dashed lines you see in a project. They are used for locating walls or aligning objects. In the family editor, reference planes are used mainly as construction lines—sort of like sketch or guide lines that can be left in a view or hidden with the Hide Element command (see Figure 7). Figure 7. Reference planes used as construction and guide lines. When creating a new family using the Generic Model template, two pinned reference planes are shown in the Ref. Level view by default (see Figure 8). When the cursor hovers on top of the vertical reference plane, it is named Center (Left/Right) while the horizontal reference plane is named Center (Front/Back). Figure 8. 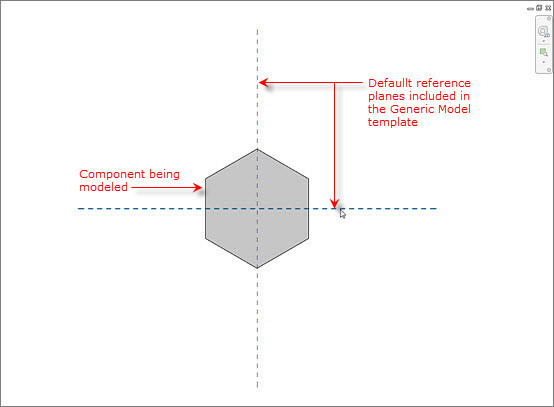 Default reference planes in a Generic Model template. Their intersection corresponds to the tip of the cursor when a family is being placed in the plan view of a project (see Figure 9). Figure 9. 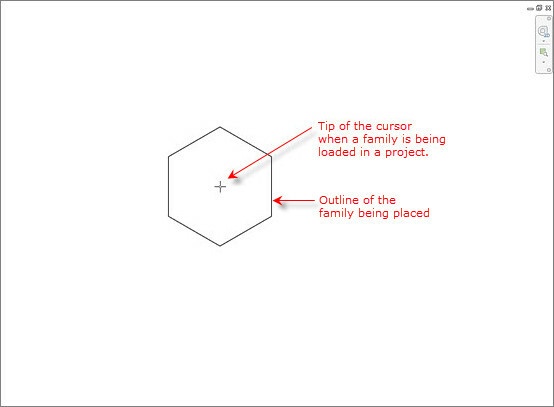 In a project, a loaded family appears at the tip of the cursor. The length of a reference plane is infinite and has no start or end points. What is being drawn is a symbolic representation of an infinite plane. It is initially used for sketching the general shape of a family. After laying them out, it is much easier to draw numerous components derived from extrusion, sweep, blend and revolve tools (see Figure 10). Figure 10. Reference planes are used as construction and guide lines. While in a sketch mode (or after finishing the sketch), a line in an extrusion can be locked with the reference plane it's on top of by using the align tool to click both lines and then clicking the lock icon (see Figure 11). Figure 11. Aligning a reference plane to the edge of a finished component and clicking the lock icon. This locking process is the first step when you want to create a parametric family. Reference planes are used to drive geometry attached to them. 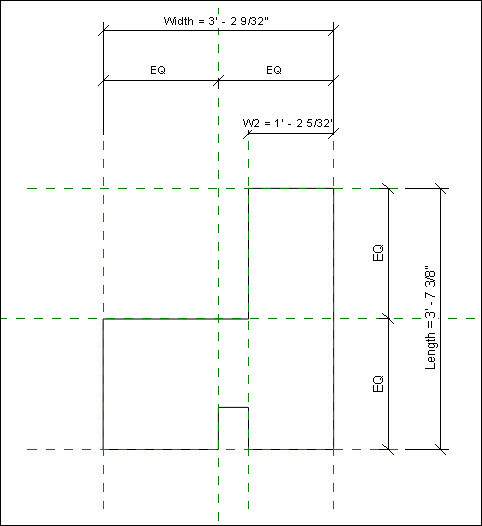 When a dimension is added between reference planes and labeled, parameters can be assigned, including height, width and length (see Figure 12). Figure 12. Adding labeled dimensions to make a component parametric. Therefore, when the value of a parameter is changed, the component and the reference plane adjust accordingly (see Figure 13). Figure 13. The reference plane and component updates when the value of a labeled dimension is changed. When a reference plane is named, it automatically becomes a work plane (e.g. top of cylinder). 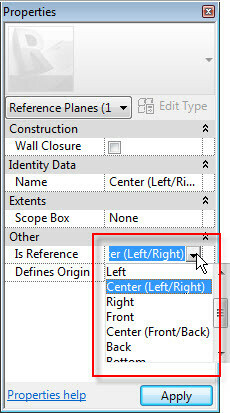 This named reference plane is added to the Name drop-down list from the Work Plane dialog box (see Figure 14), which is accessed by clicking the Set button (Create > Work Plane). Figure 14. 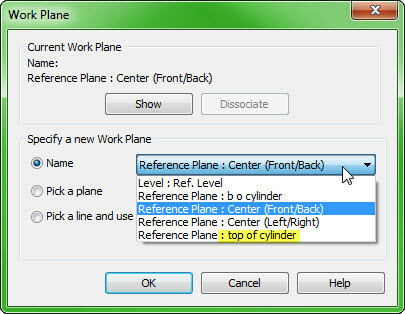 Named reference planes are added to the Create > Set > Work Plane dialog box. Figure 15. The Is Reference drop-down list. 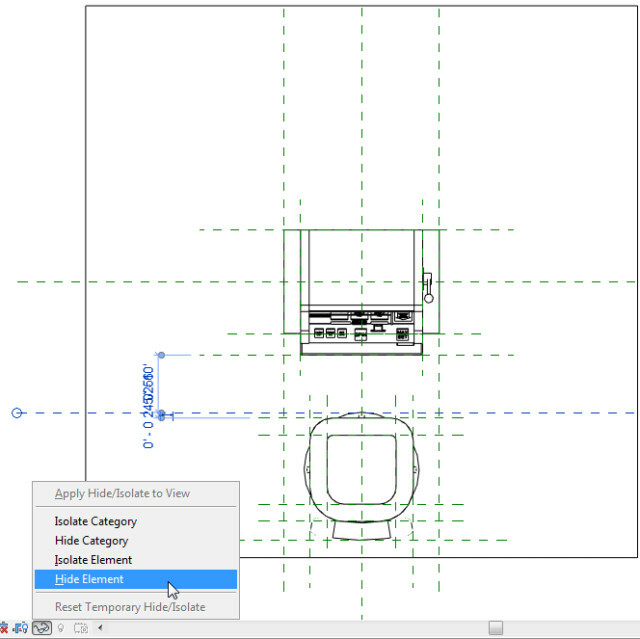 In the Family Editor, reference planes are only visible in plan, elevation and section views. 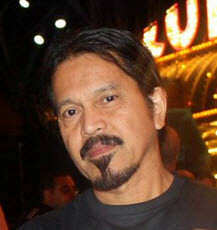 When loaded into a project, they are not visible and become the elements to which dimensions snap. 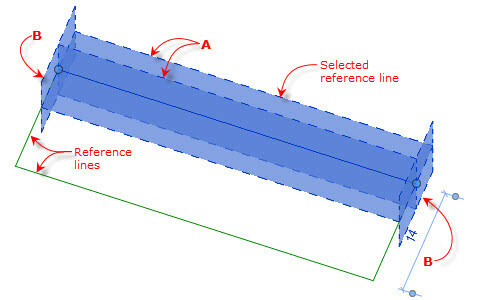 When selected, a reference plane has a feature called Is Reference (see Figure 15). This feature determines the snapping hierarchy to which dimensions snap in a project. For example, when Strong Reference is assigned to a reference plane adjacent to a reference plane that has been assigned a Weak Reference, the dimension will snap to the Strong Reference first. 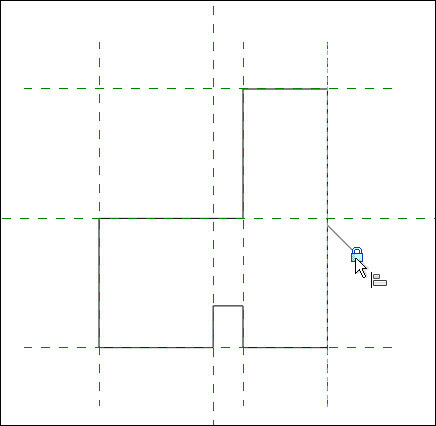 These are the solid green lines used as work planes in the Family Editor to overcome the limitations of the reference planes. Reference lines are used to control angular constraints and radial shapes of a family. 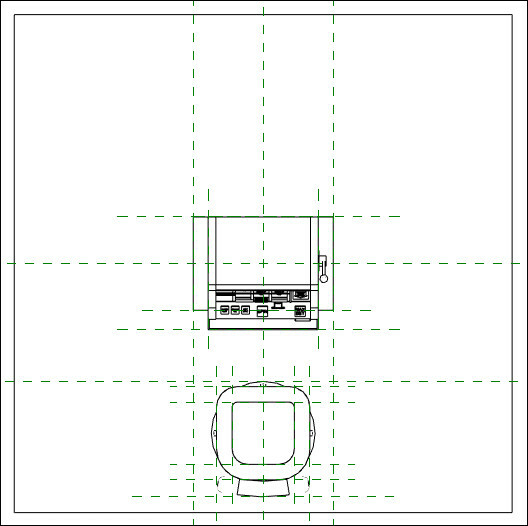 Unlike reference planes, reference lines have start and end points that can be dimensioned. They are visible in all views. When selected, reference lines consist of four work planes (see Figure 16): two on the line perpendicular to each other (A) and one at each end perpendicular to the line (B). All surfaces of family components are work planes. A surface can be specifically assigned as the active work plane by clicking the Set button (Create > Work Plane) and choosing the “Pick a plane” option from the Work Plane dialog box. After clicking OK, any surface that is clicked becomes the active work plane. In the Family Editor, models are mostly created in 2D views (plan, elevation or section views). Because modeling involves drawing 2D profiles in sketch mode, it makes sense to sketch them in 2D views. However, there are situations where modeling while in a 3D view is much more efficient. One example is when a user wants to visualize how the profile looks in relation to the overall shape of the component. This is accomplished by using the Set tool (Create > Work Plane) and choosing the Pick a plane button. After this option is selected, any surface of the component selected becomes the active work plane (see Figure 17). You can then model while in the 3D view. Figure 17. Assigning a new work plane using the Set > Pick a plane option from the Work Plane dialog box. Figure 18. A family component with a slanted surface. Suppose you want to draw an extrusion on the face of a slanted surface in a component. Obviously, making the slanted surface the active work plane and then sketching the profile from a plan or elevation will display a skewed profile. The solution here is to assign the slanted surface as the active work plane and then view its surface parallel to your vision—as if you’re looking at it in plan view. Here’s how to do it. 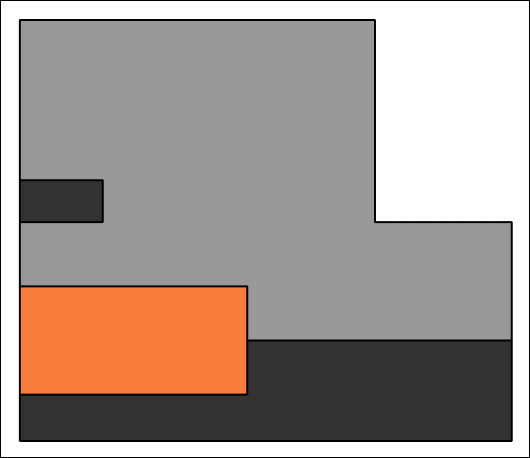 Say you want to use the extrusion tool to create a logo on top of the orange surface as shown in Figure 18. The first thing to do is open any 3D view and then right-click the top of the ViewCube. 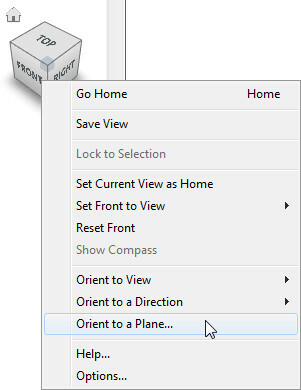 From the contextual menu, select Orient to a Plane (see Figure 19). Figure 19. The Orient to a Plane option. In the Select Orientation Plane dialog box that pops up, click the Pick a plane button (see Figure 20). Figure 20. 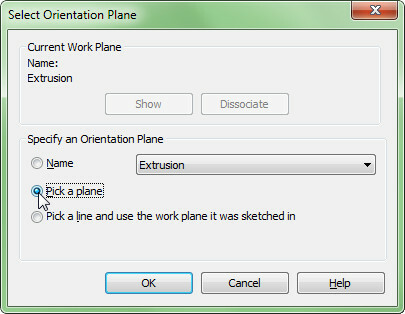 The Pick a plane button in the Select Orientation Plane dialog box. This takes you back to the 3D view. Hover your cursor on top of the orange surface, near the edge. You’ll notice that the outline of the surface is highlighted in blue (see Figure 21). Now click the mouse. Figure 21. Selecting a slanted surface. Voila! 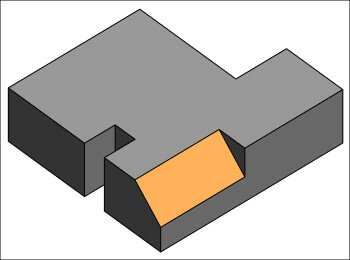 After clicking the mouse, the orange surface becomes the active work plane and then automatically rotates so that the slanted surface is parallel to your vision (see Figure 22). Now you can draw the extrusion profile accurately. Figure 22. The slanted view orients itself parallel to your vision. Determining the correct work plane is crucial when building simple to complex family components. Experiment with drawing profiles from different work planes listed in the Project Browser. Try modeling on slanted surfaces. 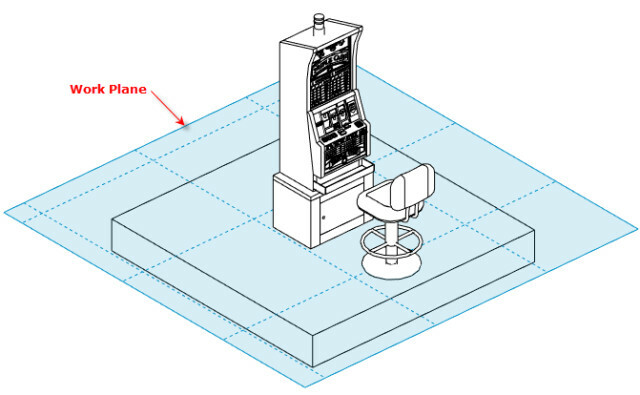 Having a good knowledge of how to work from any work plane will enable you to create complex forms such as the slot machine shown in Figure 23. The concept is simple. You just have to spend the time to experiment. Figure 23. A complex family with different work planes.